The Associate Press just put out a lovely piece about Little Things to Sew. The article was written by Holly Ramer and includes this cute photo of a little girl wearing the Reversible Bucket Hat. Your local newspaper may have picked up the story, or you might see it sometime in the next week. Included in the article is a link to a free download of the bucket hat pattern and instructions, so if you haven’t purchased the book yet you can try the pattern for yourself. Here is a link to the article in The Washington Post. Have you seen it in your local paper yet? Oh wow, this is fantastic! Congrats to you and your team! Thanks for the tip-off on the free pattern. 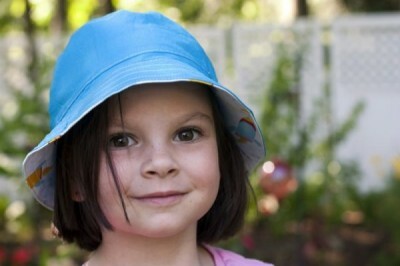 I have been eyeing this hat for awhile; it has shown up on so many mommy sewing blogs. Congrats on the great PR too! Congratulations Liesl. Very well deserved because your patterns are a delight to sew! I love the hat. I have the book now and am having trouble with the tutu skirt. I tried registering but it won’t let me register. I’m just confused about the yardage I should buy and the cut length. I think using the whole width of tulle (108″) threw me off. Isn’t that meant to be the yardage measurement? help….